For whatever faults the film suffers from, of which there are many, one thing that cannot be held against Fantastic Beasts: The Crimes of Grindelwald is the truthfulness of its advertising. It’s right there in the Mad Libs-generated title, giving away the contradictions of tone and substance awaiting the viewer before they’ve even seen a single frame. Because who doesn’t want a helping of Wizard Hitler political intrigue to go with their fun-magic-animals-and-friends romp? We could have opposite flavors to complement each other, like salt and caramel, at least in intent. What’s actually been served is more akin to cake and ranch dressing. This was also the case with the preceding entry in JK Rowling’s new franchise extended from her beloved Harry Potter books. Though based on results here her solution to that film’s problems was to cut out as much of the cake as possible and drown what was left in the ranch. Presence of the titular beasts are minimal at best here, shifting the focus instead to the prequel story that bisected the narrative of its predecessor. The powerful wizard Grindelwald (Johnny Depp) escapes his imprisonment at the start of the film. From there, he begins searching for Credence (Ezra Miller), the troubled young wizard from the first film, in Paris in order to enlist him as a weapon in his anti-muggle movement. 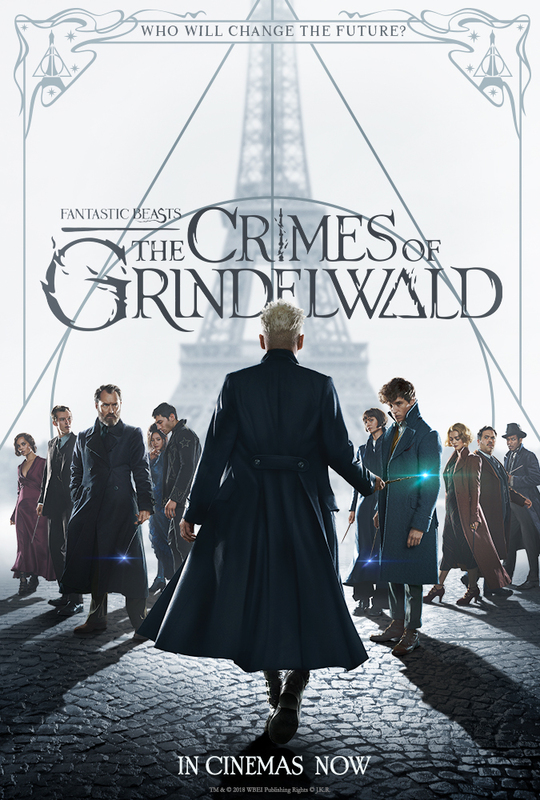 Newt Scamander (Eddie Redmayne) is enlisted by a young Albus Dumbledore (Jude Law) to find Credence as well, and stop Grindelwald. The reasons for his selection for this task are never clear, as he has no desire to do this kind of work nor does he have any personal stake in the task. The need for his involvement is made less clear when you account for how many other characters are on the same mission in parallel to him. Tina (Katherine Waterston) is now an auror searching for Credence, and working separately from the other aurors on Grindelwald’s trail in Newt’s brother and a past crush. The impenetrable web of secondary, tertiary, and quaternary characters involved in the hunt practically renders Newt’s presence curious at best. Surely any one of the other characters could serve as satisfactory lens through which to view these dark events. Returning for his sixth film in the franchise, director David Yates does little to bring new flair to the visual presentation. Keeping the grim darkness of the back half of the Potter films as filtered through dozens of layers of sepia, The Crimes of Grindelwald might be the brownest studio movie ever released. Sitting through the two hours and change runtime feels like sitting through a particularly boring and disorganized history lesson. In one late scene, the narrative ties itself directly to real world events of the time, and the potential of the story and its particular timeliness hints at something that could’ve been incredibly powerful with more clarity. Rowling’s script is comprised almost exclusively of expository dialogue about people and places and things and what they mean, and yet never is the throughline of its Rise of Fascism narrative and the scene-to-scene motivations anything less than confounding. Rowling’s stories resonated with young audiences because they were able to see themselves in the characters and their experiences, the challenges they underwent analogous and resonant to the difficulties they’ve actually had and the relationships that got them through it all. What little there was of that in Fantastic Beasts is gone here. Between this year’s Solo: A Star Wars Story and this, the Wikipedia-cation of the geek blockbuster is complete. For anyone beyond the most devoted of Potterheads, it would be difficult to imagine gaining any more satisfaction from the film than they would an afternoon browsing Pottermore. Fantastic Beasts: The Crimes of Grindelwald is currently playing in theaters everywhere.